Guillermo Rougier of the University of Louisville, Kentucky report two very significant Dryolestoid fossil skulls from the Cretaceous. Rougier, Apesteguia, and Gaetano publish the paper in Nature as an Argentinian/US collaboration. When dinosaurs ruled the Earth, South American mammals were hard to find. This specialised form, named Cronopio dentiacutus is a little like some Jurassic specimens from Laurasia, but Rougier describes Cronopio in a manner that fans of a popular animated movie series can easily understand. "It looks somewhat like Scrat, the sabre-toothed squirrel from 'Ice Age,'" he says. In the photographs, you can see the extended canines, shrew-sized muzzle, all of which took seven painstaking years to remove from Patagonian rock. Confusingly, this little known period for mammals is the early Late Cretaceous. Rougier quotes, "This time period in South America was somewhat of a blank slate to us. Now we have a mammal as a starting point for further study of the lineage of all mammals, humans included." As a human anatomy lecturer, he knows what he's talking about! Nature comments on the paper by explaining that dryolestoids were especially diverse in the Mesozoic of South America, although they have hitherto been known only from teeth. 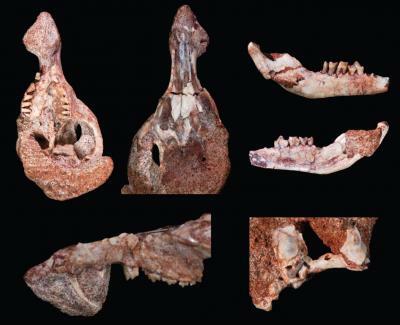 With the skulls, palaeontologists have opened up a whole "New World" of early mammal history This creature opens a new window on to a largely unexplored period in the prehistory of South America.